The Fairfax-Lee Chapter was proud to put its support behind Employer Support to the Guard and Reserve by signing a Statement of Support at its Last Wednesday event on 27 October. Signing for the Chapter was Mr. Ken Britt, President of the Fairfax-Lee Chapter. Accepting the Statement of Support was Ms. Geambro Hollis, ESGR Representative for Northern Virginia. Also in attendance were Mr. Stephen Austin, the Assistant Chief of the Army Reserve and Mr. Gordon Sumner, USAR Ambassador. ESGR develops and promotes supportive work environments for service members in the Reserve Components through outreach, recognition, and educational opportunities that increase awareness of applicable laws and resolves employer conflicts between the service members and their employers. The importance of the event was underscored by the attendance of 35-40 chapter members and guests. 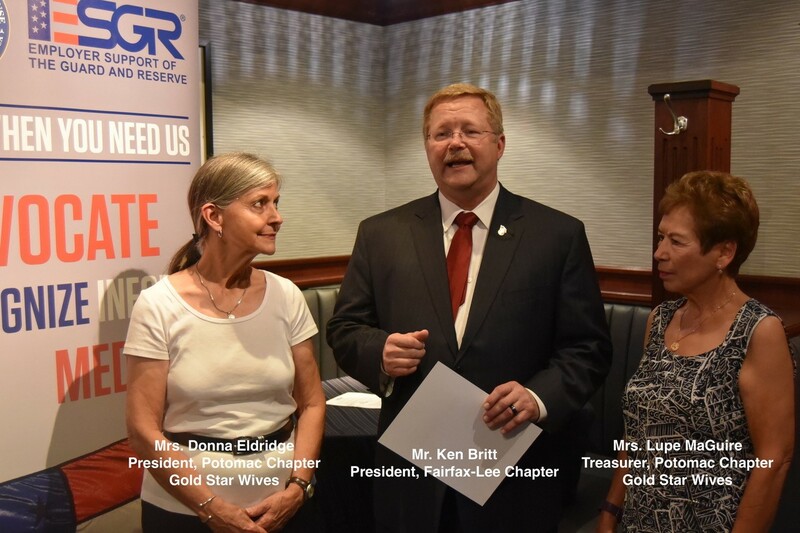 Also in attendance and warmly welcomed by the chapter were Mrs. Donna Eldridge, President, and Mrs. Lupe MaGuire, Treasurer, of the Potomac Chapter of Gold Star Wives of America, Inc.